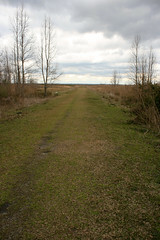 Dasy and I both managed to carve out some time yesterday, so we took the opportunity to visit Paynes Prairie. We’d been trying to get out here for some time, so we just decided to go, even though the weather wasn’t great. It was windy, overcast and threatening to rain the entire time, but it held out long enough for us to do some exploring. Paynes Prairie is a natural oddity. 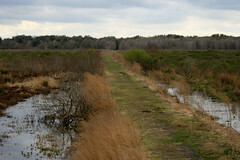 It’s part of Paynes Prairie Preserve State Park, which includes a lot of area beyond the prairie itself. The “prairie” is not the kind you think of when you think about Little House on the Prairie. It’s basically a floating mass of plants that pretty much just sits there while the water slowly flows under it. It’s a pretty strange, but interesting place. Of course, due to it’s very nature, you can’t exactly go walking around in the prairie. 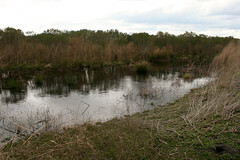 The Preserve has several good trails that will keep you dry and allow you to do some exploring. We took Bolen Bluff Trail, as it’s one I pass almost every day I go to work and I know that it actually goes out into the prairie. 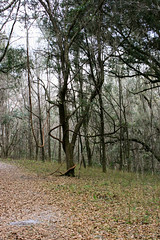 Bolen Bluff is listed as being a 2.5 mile loop. We took some detours, so probably ended up doing about 5 miles, but didn’t actually complete the loop. Expect about 3 miles total if you just want to go to the viewing platform and back to the parking area. 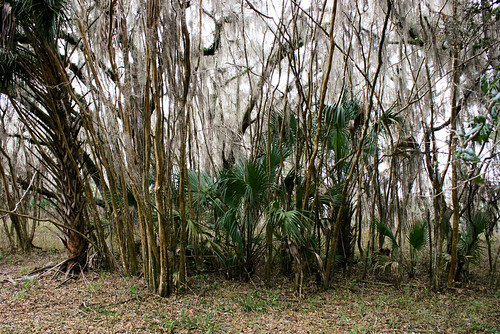 The trail starts at in “woods”, which are pretty much the standard Florida old woods, but a bit more “open”. 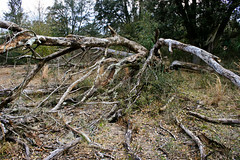 Florida woods and forests generally get overgrown with brush. This one doesn’t. You can see a fair distance and it’s quite open. A dirt trail is your guide most of the time. From the parking area, take the left fork if you want to head to the prairie. 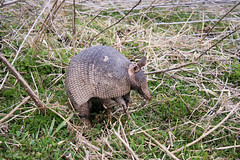 While on the prairie itself, we were pleasantly surprised to see an armadillo. We were even more surprised to see that he wasn’t the “flat” variety most often seen while driving. ;) He was foraging for something and really couldn’t have cared one bit that were a couple feet from him taking pictures. Also be on the look out for hawks, bald eagles and sandhill cranes. We saw a couple hawks and the cranes, and I’ve seen bald eagles here before. 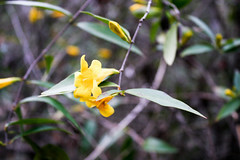 While the prairie is interesting because it’s so different, take the time to explore the scrub and forest areas too. We didn’t make it to the grass bluff on the other half of the loop, but the woods we did manage to check out were a bit different than the overgrown scrub areas I’ve been accustomed to. It was a couple hours out of the way for us, but we’re glad we made the effort. 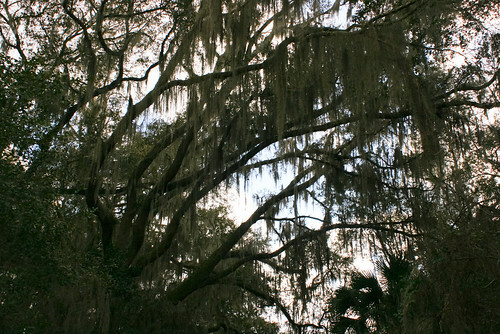 It’s an area worth checking out if you’re anywhere near Gainesville. Click on any of the pictures to see larger versions. Great pictures! Thanks for sharing them. 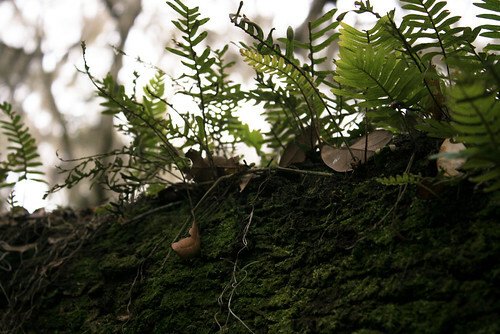 We love our hikes in Florida! Had a lovely walk there last week but beware….there is a large yellow jacket nest underneath the observation platform. Never saw it coming. As I started up the steps a yellow jacket made a “bee line” (sorry …couldn’t help it) straight for my face. HOT sting! Saw a beautiful area of passion flowers and a herd of wild horses…. Paynes Prairie is beautiful, especially at sunrise or sunset. If you’re back in the area, the Devil’s Millhopper is a fun stop. It’s a big sinkhole with stairs down to the bottom. Pretty neat place. That is so cool. I had never heard of it! Great photos, too! I’ve Coach Signature Zoe, I really like this bag!! It was the last one with one of these shades within the store. I haven’t found it at another Coach retail store either. I asked the clerks relating to this purse and they declared this specific handbag is really hot that whenever they get it, it sells out that week!! Insane! Coach Zoe Bag is produced with Coach Signature material that is treated being stain as well as water resistant. Trimmed with platinum natural leather as well as silver components. Both sides provides decorative metallic buckles, just like Carly. Shoulder band provides dogleash end and the internal is definitely layered in glowing blue silky material having three pockets.